Bruce Lee’s last ever movie, Game Of Death, was released in 1978 almost 5 years afters Bruce’s untimely death. 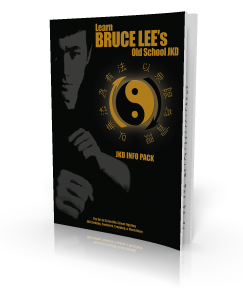 The movie was cut ‘n’ pasted together with unfinished pieces of footage that Bruce had filmed but put on hold, because he went to film his first ever Hollywood blockbuster… Enter The Dragon, which catapulted him to World fame. Dan Inosanto, one of Bruce’s closest friends and confidantes’, was asked to help the studio complete the Game Of Death movie, having starred in it himself facing off to Bruce Lee in the pagoda fight scene (Dan was the chap wearing a black outfit, red bandana, brandishing the nunchuks). Since Bruce Lee took the storyline to the grave when he passed, the Bruce Lee family & friends did the best they could to compile a meaningful storyline from the remaining footage. We will never ever know what Bruce actually intended to express in this movie, but this is the best interpretation from Bruce’s closest circle. During Game Of Deaths’ compilation, Dan had done his own voice dubbing using his own 8mm film projector, and had asked his youngest JKD Back Yard Group member, Chris Kent, to record the yells and screams, coaching him whilst watching excerpts from the original movie in his garage. Several days later Chris auditioned for the producers at Samuel Goldwyn Studios, and ended up getting the job as the ‘screamer’. Chris spent two days studying the film footage, and yelling and screaming his guts out. Humbly Chris admits it was not as good as Bruce’s own yells. However, I believe it was as good as it was going to get. This was to be Chris’s first taste of the world of Hollywood showbiz. Here’s to you Chris… WATAAAH!! !